A+ Family Dentistry (San Diego) - Book Appointment Online! 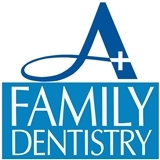 A+ Family Dentistry focuses on adult dental care so whether you have a toothache, need a simple cleaning or haven't been to the dentist in a long time, we are here to help you. We take the time to explain the treatment to you. And we understand your needs. We also also open on Saturdays to make it easier for those that work all the time. Please come visit us! I had a good experience in my first visit with Dr.Janice and she was very informative with everything that was going on with teeth.